If you happen to be in my hometown Arendal during a weekend, I would highly recommend lunch at Madam Reiersen at Tyholmen, in the oldest part of the city. During weekend they serve Danish frokost, a traditional buffet with all the delicacies our Scandinavian neighbours have to offer. I went there a Saturday in March, and ended up very satisfied and a little tipsy. But I would recommend that you made a reservation as this is a popular event during weekends. 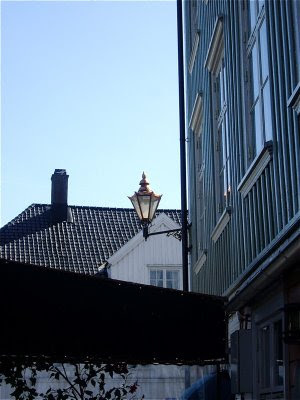 Madam Reiersen is located in one of the old houses at Tyholmen, where you find wooden houses built during 4 centuries. The restaurant has the ground floor of a mid 19th century house just a stone's throw away from the bus and train station. Tyholmen is a wonderful quaint part of town and from April to early October you may sit outside admiring the old harbour, Pollen, and the beautiful houses nearby. A young staff presented us with their lunch menu, but we knew what to order. They had a special offer to the buffet, 65 NOK (7 EUR) for one bottle of Carlsberg (37,5 cl) and 2 cl Aquavit to follow the buffet. If you want to drink and eat as a Dane, this is what to order. The staff were professional and gave us good and swift service. Madam Reiersen has a charming interior in shades of caffe latte and brown, and dark brown floor boards. Everywhere you have wonderful rustic details shows that this is a house with a past. The character is underlined by traditional decorative elements. One part of the resturant has traditional tables, whereas the other has a bar interior with bar stools, tables and sofas in light brown leather. Accompanied by: Mustard and dill sauce, remoulade, pickled cucumber, mayonnaise, raw onion, pickled red cabbage, brown gravy, and salad. Danish rye bread, and three fine and grain breads. Butter. Presentation: This was a true feast, delicately presented for us to tuck into. The dishes were well seasoned and balanced, but there are a few rules to follow when eating at a Danish buffet. Enjoy your main dishes with ingredients on the trays. Choose pickled cucumber to the liverpaté and the Danish cucumber. The sweet- and bitterness will provide a delicate contrast to the salt dishes. Choose the dill and mustard sauce to the smoked samon. It will not feell very greasy, even though it is partly mayonnaise based, and it is deliciously sweet. Choose remoulade to the plaice, and pickled red cabbage to the pork. Breads: Rye to the liverpaté and hamburgers, fine bread to plaice and salmon. The only traditional part of a genuin frokost table that was not there were small shelled shrimps. Texture: The breaded plaice fillets were warm, but a little soggy. None of that crispness you get when perfectly prepared. Hamburgers were a little tough and dry, and the liverpaté was not luke warm, as it should be. Taste: It worked very well. The hamburgers were a little salty, but all in all the dishes blended in perfectly with the sauces and garnish. Do enjoy a beer and a lille en to your buffet. The refreshing beer the is perfect drink, and the aquavit will, besides the delicate herbale taste, also provide relief for your digestive system. Dejligt, as the Danes would say passionately. A Danish frokost is a meal with delicacies in abundance. If the stretch of sea called Skagerak did not separate Norway and Danmark, I would say that Madam Reiersen is a part of Denmark during weekends. Do not hesitate - try it, when visiting Arendal! !